Members of the Fighting Addiction club participate in Marshall’s Unity Walk Monday. 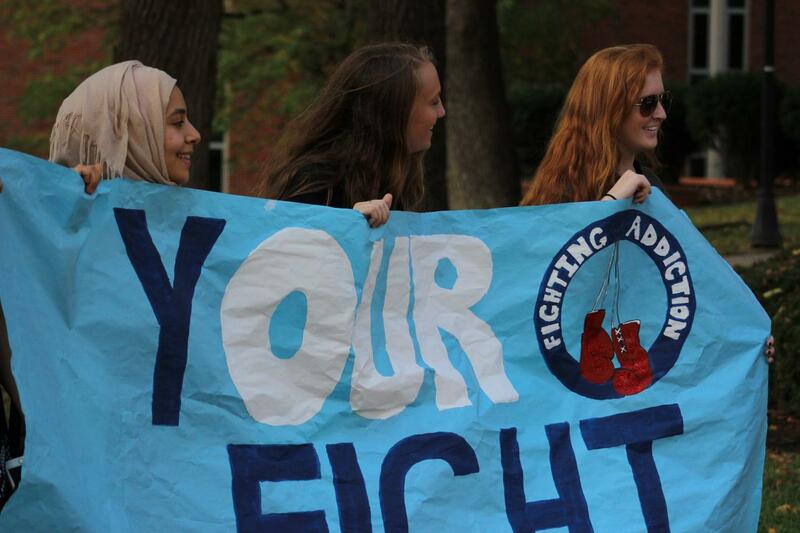 Fighting Addiction is a new club on campus looking for members interested in “changing the narrative” of the opioid epidemic affecting the community, according to club president and second year medical student Mouhammed Sakkal. The goal of the club is currently to increase in size and bring together students to help make a difference in the community. The club has held their first formal meeting and participated in the Unity Walk Monday. Sakkal said the club wants to approach the problem from an educational perspective, focusing on media outlook and advocating for laws and policies that could alleviate the situation. He said the organization will not solve the issue, an unrealistic goal for a student organization, but that he hopes they can be a part of the solution. The club has an upcoming meeting with the Mayor’s Office for Drug Control Policy Monday to discuss what they can do as students to counter the issues. The group also plans to reach out to Recovery Point, a local addiction recovery center, as well as host philanthropy opportunities for students who want to get more involved. Deena Dahshan and Paige Lester, senior biology majors, said they joined because the opioid problem is something that “really hits close to home” living in Huntington. Lester said she sees a lot of apathy towards the issue and believes if more people were willing to extend compassion to their community, everyone would be benefitted. Students looking to help out with the organization can send an email to [email protected] and they will be added to a list to be informed when the next meeting will take place along with other information about the club. Sakkal said his vision for the organization is to create something where students can get involved and be a part of the solution to an issue that’s not going to be solved overnight.